Nice blog. I have a new one. I added you to my friend list, so if you like me blog please follow and add me. Great find I have been after this for some time. Thanks mate. Absolute aces on both sides. Top side is pure Marcus Hook Roll Band - did this precede or follow 'Natural Man?' The plug is fabbo AM pop gold that I almost prefer to the rockier a-side. Just fantastic! 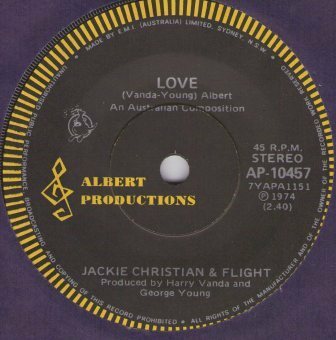 Jackie Christian and Flight worked with Vanda and Young on a number of sessions. Flight was made up of Tony Currenti on drums, Phil Doherty and Michael Meehan on guitars and vocals, and Steve Hart on Bass. 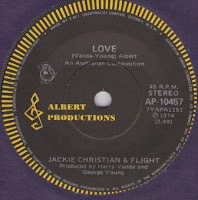 Jackie Christian and Flight also recorded 'Love Fever' with Vanda and Young. 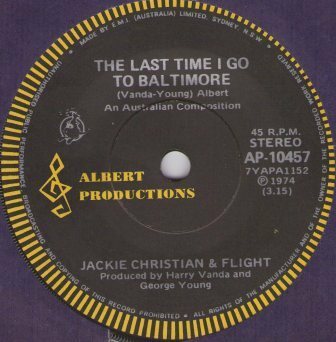 However a decision was made to give the song to Ray Burgess who simply sang over the music track already laid down by Flight. The song was a top ten hit for Ray. 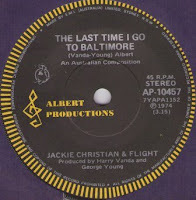 Not long after, Jackie Christian went solo and the members of Flight disbanded and went on to join various succesful bands. I believe that the name Target was used overseas as Flight was registered to another band.